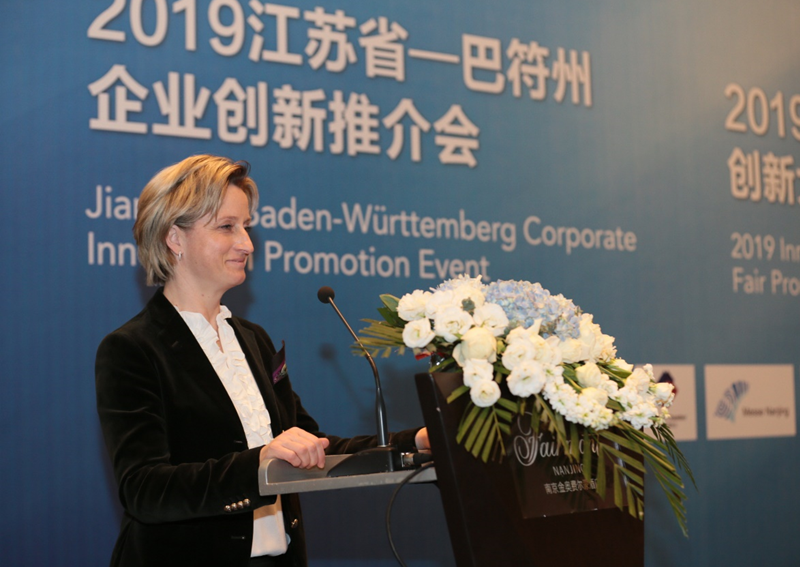 Under the organization and invitation of Baden-Württemberg International, the Ministry of Economic Affairs, Labour and Housing of Baden-Württemberg organized a 100-person political and business delegations to visit China and participated in the Innovation Promotion Event held in Nanjing. Director of the Jiangsu Provincial Development and Reform Commission Li Kanzhen, Deputy Director Zhao Jianjun, and Deputy Inspector Yin Jianqing attended the Innovation Promotion Event. Dr. Hoffmeister-Kraut, Minister of Economic Affairs, Labour and Housing of Baden-Württemberg, Dr. Christine D. Althauser Consul General of the German Consulate General in Shanghai and hundreds of representatives from more than 70 units including the relevant departments of the Baden-Württemberg State Government, the State Assembly, relevant enterprises, associations and research institutes attended the meeting. More than 400 people from more than 260 enterprises and development parks in various cities of Jiangsu Province attended the meeting. The meeting was presided over by Deputy Director Zhao Jianjun. Dr. Kraut and Director Li Kanzhen delivered speeches for the opening ceremony respectively. Director Li Kanzhen and Dr. Kraut said that they will further promote cooperation between Jiangsu Province and Baden-Württemberg. After the opening ceremony, hundreds of enterprises from Baden-Württemberg and Jiangsu Province conducted further discussions on topics of common interest such as investment and trade cooperation and technical exchanges.